We all have that friend. You're making morning drinks, everyone is having a nice time, the weather is fine, mirth is a'plenty. You ask your friend -- you know, that one friend -- to "kindly pass the Champagne," as your mimosa glass is looking famished. "Um, I think you mean sparkling wine. This isn't real Champagne." And even though you probably want to slap the smugness straight out of their pedantic smug… they're probably right. There is definitely a distinction between sparkling wine and actual Champagne. Since you (obviously) don't want to have to engage with anyone who would purposefully correct you on such a trivial matter, we're here to explain the specific differences between the two, with (more than a little) help from Heather Perkins, the Beverage Director of DiAnoia's Eatery -- a Pittsburgh Italian restaurant known for its wine list… and incredibly photogenic bread bowls. Just remember: There's no shame in asking questions, but there is slight shame in being clueless. Sorry. "In its simplest form, sparkling wine is wine with C02 bubbles suspended in it," Perkins said. "How those bubbles got there, and where they got there, really makes all the difference." Sparkling wine is easy to spot. It's carbonated wine. Wine with bubbles. Prosecco is sparkling wine. Cava is sparkling wine. Sekt is sparkling wine. And yes, Champagne is in fact sparkling wine, too. But not all sparkling wine is Champagne. This is important. What matters here is method, and location. Let's burst this bubble. Well, what is Champagne, then? The easiest way to spot real-deal Champagne… is to look for the word "Champagne" on the bottle's label. Duh, right? Well, this is a big deal: gaining the designation of "Champagne" means the bubbly in your hand has followed some ridiculously rigid specifications en route to your flute. Much like Cognac's difference from the larger umbrella of "brandy," Champagne is a sparkling wine that's defined by its region of origin, and an officially designated method of production. "When you see the term 'Champagne' on a bottle, it really means something," Perkins said. "Essentially, you are looking at one of the highest designations of wine in the entire world. It's a word that has become synonymous with tradition and quality. It actually might be the most well known varietal of wine, ever." Simply put, Champagne is the rampant overachiever of the sparkling wine class. And it goes through a fermented gauntlet to end up in your Mimosa. For a sparkling wine to be designated "Champagne," it first has to originate from the Champagne region of France -- known for its wet, cool climate, and mineral-rich soil. "The soil may be the most important part of the entire process," Perkins said, "and every bottle of Champagne is truly years and years in the making." Champagne primarily comes from three grapes: chardonnay, pinot noir, and pinot meunier. And, it goes through what is referred to as the "Traditional Method," or Méthode Champenoise. "The big difference with Méthode Champenoise, is a second fermentation process that happens inside the bottle, after the initial fermentation process," Perkins said. "This creates C02 that's captured within the bottle, and carbonates the wine. So really, one bottle of Champagne is an entire 'batch' in way. Some bottles will sit for literal decades before they're even sampled. That's one of the reasons it's such an investment." There are several other methods to make sparkling wine, including the "Tank Method," (commonly used to make Prosecco, for example). Here, the second round of fermentation is done in a tank (hence the name…) and not in an individual bottle. So, it's better for big batches, but it also has a slightly less-than-Champagne reputation for quality. "It's much less risk, but doesn't have the prestige that comes with the Méthode Champenoise," Perkins said. If you adhere to the Méthode Champenoise, in Champagne, with grapes from Champagne… well, you've got Champagne. What if you make "Champagne," outside of Champagne, France? The Méthode Champenoise is actually one of the most popular ways to make sparkling wine in the world. Needless to say, it definitely happens outside of Champagne -- and France, too. "Winemakers all over the world use Méthode Champenoise to make sparkling wine," Perkins confirmed, "in Italy, in the States, even in parts of France that aren't Champagne. It's the same process, same varietal of grape, but just in a different location." 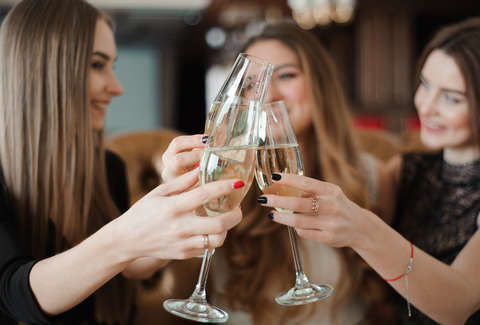 In America, we have sparkling wines that are prepared in the exact same fashion as traditional Champagnes like Lady Edythe Reserve Brut by Frank Family Vineyards, or Caraccioli Cellars 2007 Cuvée Nature. "You can definitely find some excellent sparkling wines made with the same process, that aren't technically 'Champagne," Perkins said. So why is Champagne so "special?" It does beg the (possibly naive) question: if you can basically make the same thing anywhere, why does it matter if it's from Champagne, anyway? "Sure, a lot of the reputation might be based around tradition and pedigree," Perkins said. "But, you also can't discount the consistent level of quality that continues to come from the champagne region of France. The big difference here comes down to the soil." The soil -- and by extension the grapes -- in Champagne has a natural advantage over the rest of the world, as it is the perfect climate to raise the mineral-y, acidic grapes needed for an ideal bottle of champagne. And as far as the notoriously high costs go…. "It's a relatively small region, and clearly, making champagne is an extremely labor-intensive process," Perkins said. "Again, we are talking about years and years of cultivation, then even more years of fermentation and aging… up to 30 years in some cases. And it's all done on a bottle by bottle basis." Time is money. And Champagne takes a lot of time. "The big takeaway, is that Champagne definitely has earned its reputation. And every bottle of Champagne has followed rigorous, time-consuming guidelines to end with that designation. But, there are definitely other sparkling wines that are worth your time." So if you want a "Champagne experience" on a Prosecco-esque budget, check the label. If your wine was made in the Traditional method, or Méthode Champenoise -- you're getting almost the same thing. "Still, you should spring for a bottle of actual Champagne, at least once," Perkins said. "It's worth it." We tend to agree with that statement.